Is that even possible? Many would say that wabi-sabi is not necessarily something that you can completely define but rather something that you recognise and feel when you see it. Something that brings harmony to break away from hectic life for an appreciation of nature around us. Wabi-sabi is also about accepting the natural cycle of growth and deterioration. To be able to see beauty in things that at a first glance may look obselete but that ultimately have an inexplicable beauty. There is no direct translation of wabi-sabi in English. It is often equated with “rustic”, but it is not as simple as this one word “translation” suggests. Wabi has many meanings among which are simplicity, rustic beauty and elegance with a focus on the unmaterialistic and being humble by choice. Sabi also has many meanings including beauty of age, appreciation of cycles of life, artful mending of damage and things which carry the burden of their years with dignity and grace. So not exactly just “rustic”. The origins and history of wabi-sabi are largely associated with Japanese culture, specifically the tea ceremony. As a reaction to ornamentation and excess, the ritual of this ceremony focuses on an appreciation and celebration of things handmade, cracked and uneven such as bowls, cups and utensils. A celebration of the beauty of their imperfections. A common example of this would be the Sake Cup whose “imperfect” and rough finish creates its beauty. A beauty of things which have been broken but well repaired. 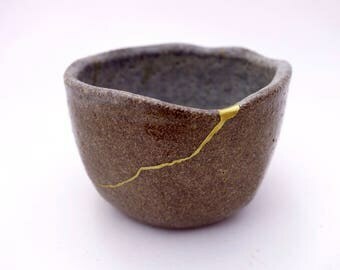 Wabi-sabi can be linked to Kintsugi, also known as “golden joinery”, the Japanese art of repairing pottery. The idea of repairing broken objects is adding to its history and thus to its beauty. The object´s value increases as itscracks and damage remain visible. It is a value of beauty which is undeclared which is conveyed through the emotion it makes the viewer feel. Wabi-sabi, rather than a theme of decoration , is a mind-set and an outlook on life. While Western standards of beauty are rooted in classical Greek ideals of beauty and perfection celebrating symmetry, smoothness and straight lines; wabi-sabi celebrates organic shapes, rough textures and curved lines. It´s about harmony with, and adaption to nature as opposed to control of nature and adaption to machines and technologies. Therefore, wabi-sabi offers a fresh, and arguably unburdening, philosophy and aesthetic to live by. Misshapen cookies that unexplicably taste better than perfectly round ones. The satisfaction of tearing off pieces of a baguette as opposed to perfect slices. Appreciating the beauty of the wear and tear of your clothes and favourite things; their authenticity and uniqueness that has developed with the passage of time and nature. In many people´s views, perfection is often subconsciously equated with that which is “right” or “good”. Wabi-sabi is about letting go of the idea of perfection and learning to appreciate the imperfect. To be satisfied with life once we remove the unnecessary.